French waitress at Fortress Louisbourg Restaurant on a sunnier day. As winds from the Atlantic roared outside, we ducked into the shelter of the L’épée Restaurant in the Fortress Louisbourg. Seating us at a wooden table with two strangers, the waitress, dressed in homespun with a cap on her head, handed us a large spoon and warned us “This is your spoon. Do not to lose it. It is the only utensil you get.” She then handed over an enormous napkin and instructed us to tuck it into the collar like a bib. We warmed up over bowls of vegetable soup that had been prepared in a brick fireplace, with bread baked in ovens at the on-site bakery at the Fortress of Louisbourg. We poured water from a common pitcher in the middle of the table where we were seated with strangers, and drank strong tea from pewter mugs. On my recent road trip through Nova Scotia, I stuffed myself with the fresh seafood available everywhere. I also plunged into the cultures that predominated in that Canadian province. 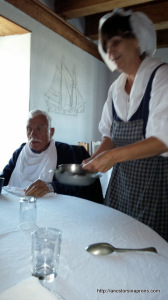 Those cultures include strong influences on what people eat, and here in Louisbourg, we were getting a taste of a 18th century French settlement. Of course I looked for books to document the experience! And luckily, I found two cookbooks I could bring home to remind me of how I “ate the culture” of Nova Scotia, one French colonial and one Gaelic. The French and English contended for control for decades. Ultimately, the English won and expelled the French, sending the French Acadians scurrying to safer places–including the Cajun home in Louisiana–but that did not mean that all of Nova Scotia automatically took on an English tone. 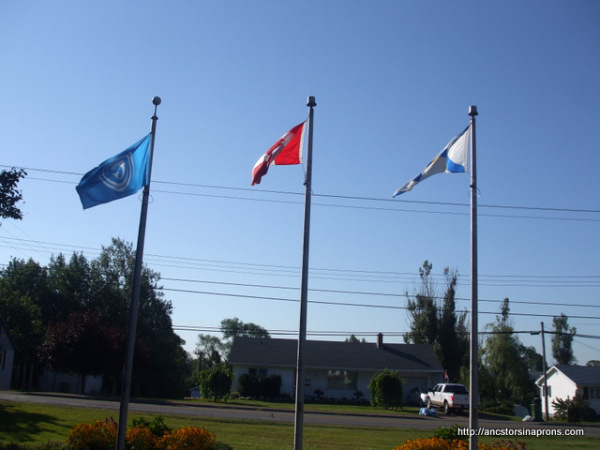 Many pockets of Acadian culture remain, as some of the French Acadians returned years after the expulsion and settled in places like Cheticamp. This National Historic Park turns back the clock with a living history museum in the rebuilt French fortified town of Louisbourg. 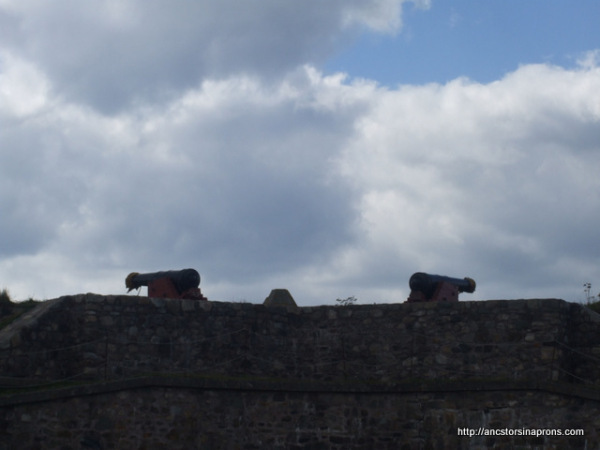 You can visit with the soldiers, the tavern keeper, the workmen and the wealthy merchants as you wander around this beautifully rebuilt fortified town. Next door to the Louisbourg restaurant, in the gift shop, I looked over the collection of books–some novels set in the historic Fortress of Louisbourg, children’s books, and cook books. The one that caught my eye, From the Hearth, by Hope Dunton with A. J. B. Johnston, provides recipes that would have been used in the 18th-century at Fortress Louisbourg. This book is solidly researched. In the introduction, the author explains that although there are no surviving individual recipes from Louisbourg, we know what ingredients they had available (lots of dried peas and lots of cod, but no tomatoes or potatoes yet) and what cook books they might have brought from France. A few days before our visit to Fortress Louisbourg, we visited Pictou where the ship Hector, known as the Scottish Mayflower, landed with the first boatload of Scottish settlers in 1773. There I spent the morning at the McCullough Heritage Center and the home of an amazing early settler. 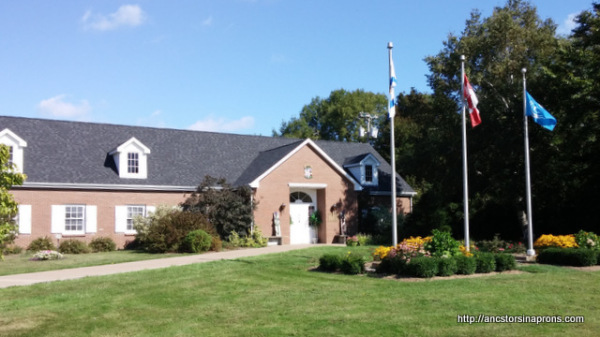 The Heritage Center is dedicated to preserving the history and culture of the Scottish settlers on Nova Scotia, and in their small gift shop, I found a cookbook with recipes in English on one side and in Gaelic on the facing page. 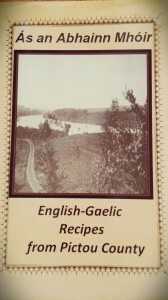 Ás an Abhainn Mhóir (English-Gaelic Recipes from Pictou County), 2011 is a spiral-bound cookbook assembled by The Pictou County Cookbook Committee. I do not know where it is available, but you could contact the gift shop of the McCullough Heritage Center if you are interested. 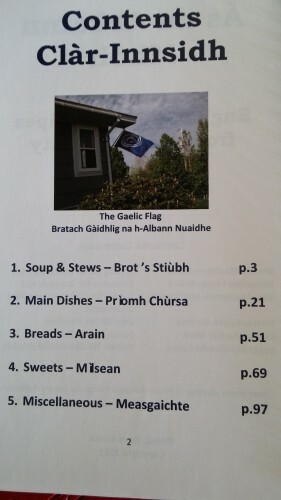 Contents page of Gaelic Cook Book. Like most community spiral bound cookbooks, the contents are uneven, but I’m eager to try some of the authentic recipes that we enjoyed in Nova Scotia, particularly oatcakes. While this cookbook does not contain the historic detail about food and cooking that the Louisbourg cookbook offers, the committee avoided throwing in modern casseroles and jello desserts. The recipes do appear to be traditional. I love the stories, sayings, poems and song lyrics scattered through the book, because we learn even more there about the way of life of the Scottish settlers in North America. Sometimes I read books and then go somewhere. Sometimes I find books along the way. These cookbooks will ensure that memories of my visits to Fortress Louisbourg and to Hector will remain for a long time. So glad you had the chance to experience some of the French and Gaelic cultures of Nova Scotia. I look forward to reading about your adventures with making oatackes, too. It was so cold when we were at Fortress Louisbourg, I can only imagine how frigid it must be now. When my sister and I were there three years ago, in the summer, we got to experience a music and dance party in one of the drawing rooms. It was delightful. But last month when Ken and I were there, most of the buildings were closed down and they were operating with a skeleton staff of reenactors, so it did not have the same lively feeling I had experienced before. Good thing to note for people traveling in Nova Scotia. Go to Louisbourg before September!